TCS provides a belt measuring service to measure the depth of textile and steel reinforcements in rubber conveyor belts, and measuring the remaining rubber thickness of in-service belts during maintenance. Background: A wide variety of rubber conveyor belts for heavy-duty industrial and mining service such as ore and mineral transportation incorporate internal layers of woven fabric or steel cords for strength reinforcement. 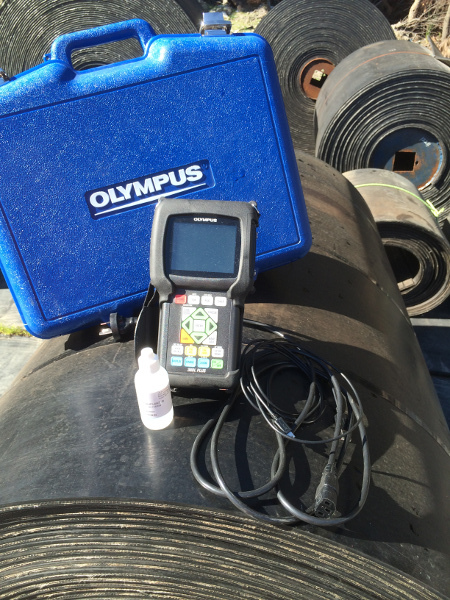 Because large belts can be very expensive, accurate information on remaining rubber thickness is valuable to users. Our instruments and transducers have been successfully employed in this test for many years. Sound energy reflects off the first layer of reinforcement, and in the case of textile or fabric reinforced belts very little sound energy will penetrate deeper. Measurement of total belt thickness is normally possible only in the case of some steel-reinforced belts where there is sufficiently wide separation between the steel cords to permit sound energy to travel unobstructed the opposite side of the belt. However, the critical dimension for most users is the amount of rubber over the first reinforcement layer, not total thickness. This is usually a straightforward application for ultrasonic thickness gaging. TCS use an innovative instrument that signals a new era in ultrasonic thickness gaging. Ideally suited for almost every ultrasonic thickness application, this handheld thickness gage is fully compatible with a full line of dual and single element transducers.